Jacob Busch is admitted to the Ohio State Bar and is registered to practice before the U.S. Patent and Trademark Office. He earned a Bachelor of Arts Degree in Chemistry from Case Western Reserve University in 2011. He earned a Juris Doctorate in 2014 from Case Western University School of Law with a concentration in Intellectual Property. Prior to joining the firm as an associate, Jacob worked at the firm as a clerk since 2013. 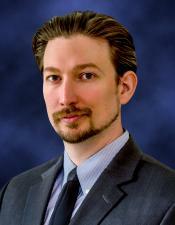 Jacob has experience in patent preparation, prosecution and opinion work. Also, he has technical expertise in drafting and prosecuting patent applications regarding software , chemical , mechanical, biological, and electrical technologies. For example, he has experience drafting and prosecuting applications involving: artificial intelligence, deep neural networks, cloud computing environments, application program interfaces, encryption techniques, quantum computing, data compliance, polymers, paints, inks, molecular encapsulations, therapeutic compounds, antimicrobial compounds, printers, copiers, automotive devices, microprocessors, semiconductors, logic circuitry, lab-on-chip devices, deterministic lateral displacement arrays, condenser arrays, molecular labeling techniques, medical treatment methods, and/or medical devices.